Loveless Zoritsa is the first long film made by Greek Director Hatjicharalambous Christina and Serbian director Pavkovits Radoslav. The film is a Serbian black comedy, with elements of Gothic and fairy tale, that is inspired by folk legends and myths of the Balkan countries. 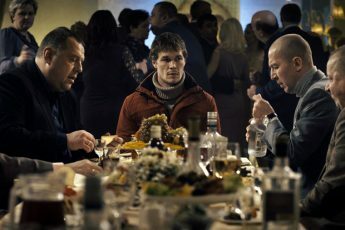 It takes place in a typical Balkan village in Serbia although it was shot in different locations in Serbia, Greece, Cyprus and Poland which are also the respective countries of the film’s production companies. Zoritsa is the only girl born without a mustache in an all female family who have traditionally been born with mustaches. The lack of having a mustache is considered to be a bad sign for the family and the girl is cursed throughout all of her life. Every man who falls in love with the young and beautiful Zoritsa soon dies in an unexpected way. After years of being away, the young girl returns to her village on the “Day of the Dead” to burn the grave of her first love who died because of her curse, hoping that this will help her break the spell and return to a normal life. Once the villagers see the girl, they begin to chase her so as to kill her, believing that she is the reason for the village’s long curse and for the death of several men. The only people who seem to want to support Zoritsa are two policemen, although one of them dies early in the film (as he is proven to have been in love with her). The second policeman, who has come from Belgrade to investigate, seems to doubt the existence of curses and laughs at superstitions. Although he is convinced that the girl is involved in some kind of Satanist group, he soon enters in a crazy adventure trying to save her from the anger of the villagers and Zoritsa’s ancestors. But as he gets to know Zoritsa better, he finds more and more truth in the existence of a curse around the girl. She tries to help her break the spell while slowly falling in love with her. Loveless Zoritsa is a well-shot film full of exaggerations. Elements of kitsch, special effects, and over-acting appear as conscious aesthetic choices of the directors. The directors thus follow a tradition that still dominates Balkan movies of the last years. At the same time, however, the directors seem to take a distance from making a specifically Balkan oeuvre. The story, for example, although inspired by Balkan legends and superstition, is itself not based on any specific folk tale. In a discussion after the movie screening at the festival in Thessaloniki, the directors claimed that it is imaginary. So while the story is supposed to be original, the film doesn’t give a particular new feel to the Serbian movie landscape. It is a funny film that has surely done well in triggering the audience’s laughter with its humorous images (the grandmother with a mustache, the funny ways in which Zoritsa’s lovers die, slapstick, etc. ), though some of the jokes go a little too far, and don’t seem to connect with the film’s plot. There are, for example, a few references to Western culture (one of Zoritsa’s lovers wanted to become a lifeguard like Mitch from the American series Baywatch), a disposition for referentiality which may also be seen as a particular Serbian gusto. With similar Western references, however, allusions to specifically Balkan ones appear to fall short. In Loveless Zoritsa, one can tell that the directors wanted to do a light, funny film which is pleasant to watch. They have definitely succeeded in this. However, it would be interesting if the young directors aimed at a more genuinely Balkan work in their next films. The legends, the myth histories, the folk stories and the music of the Balkans are of great cultural interest. A scenario based on a true, or a mix of true myths or tales, may have added some more ethnological interest to the movie. They are elements representing both the similarities and differences between Balkan nations, and have been used throughout Balkan history as expressions of ethical and cultural identity and pride.